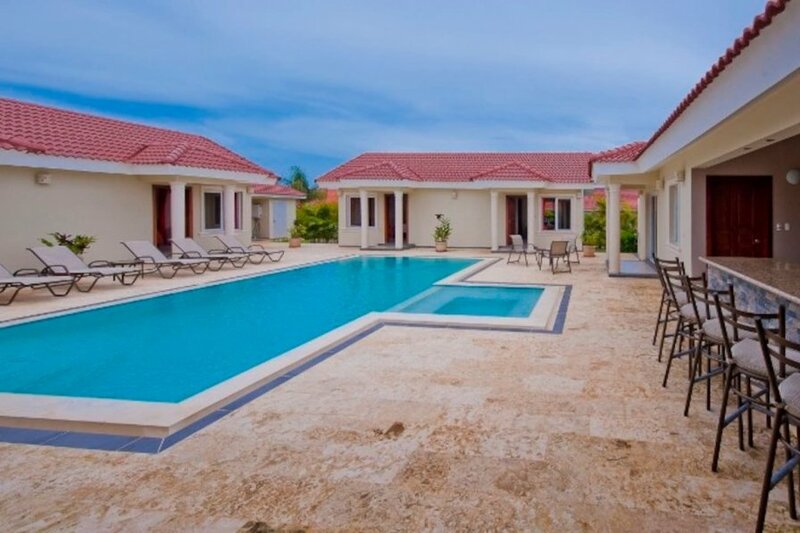 This 6 bedroom villa is located in Sosua and sleeps 12 people. It has WiFi, parking nearby and air conditioning. Each room has its own entrance to the room, en-suite private bathroom, a cable TV, an air conditioner and a safe! Has two furnished palapas for the nice BBQ evenings for the big groups of your family and friends. And a gigantic pool with an installed Jacuzzi surrounded with sun chairs would be just perfect for getting some tan under the warm sun of the Dominican Republic! Fantastic villa in one of the most well taken care community on the north coast only minutes from the beach with 24 hours security and 24 hours electricity, this villa if fully furnished and kitchen with all cooking utensils, a/c in all the bedrooms, safe, BBQ and large private pool. TV with premium channels and free wireless high speed internet. There’s an electricity consumption credit of 35 Kilowatts per day included in the rate. Upon arrival and departure, a reading of the electrical meter will be done. Additional electricity charges may apply, based on air conditioners usage.